When Christmastime comes around, you will probably be ready to pull out the decorations and make sure your home is as festive as you feel. Of course, the front door will be very important, since it is the first thing people will see when they visit, and it will get plenty of views from people driving by, as well. You could do the classic, typical wreath, but what if you want something different, fun, unique, and unexpected? Here are plenty of different ideas so that you can decorate your door for the holidays and keep things unique and interesting. You know how beautiful garland can look on your fireplace mantle or twined around the railing for your stairs. Now imagine it draped around your door, creating a beautiful framework for your entryway. Garland for the door can be lighted for an extra bit of beauty. Additionally, it can include extra details that suit your personality, like holly berries, artificial birds or flowers, etc. Garland gives you plenty of room to be creative and a garland hanger like this one will give you plenty of ways to create the perfect holiday door. Take an ornate photo frame and paint it a trendy holiday color, like ice blue, sage green, or turquoise. Then, use ribbons to hang some matching antique style glass or aluminum ornaments so that they fall into the center of the frame. Place this display on your door. It echoes the holidays but adds something new and creative to your entryway. A wreath can still be the ideal option, but it doesn’t have to be the same old thing you see on doors year after year. Instead, look into modern trends for using greenery in a new and fresh way. For example, try dressing up a wreath with peacock feathers or pheasant feathers. Incorporate something different from the classic holly berries and choose apples or oranges or something else unexpected. Instead of using bright reds and greens as would traditionally appear on a wreath, pick muted greens, turquoise, or ice blue. If there is a thrift shop or antique store anywhere nearby, then you have the perfect chance to create an old fashioned door display that still feels modern and fresh. For example, hang old ice skates along with some greenery on the front door. Choose to decorate the whole entry with traditional plaids, greenery with red ribbons, and wicker style trees. The result will be a warm and cozy entrance into your festive home. Just be careful that you don’t go overboard or your décor will turn into clutter. When the holidays come, you probably feel quite festive and you want to ensure your home reflects what’s in your heart. 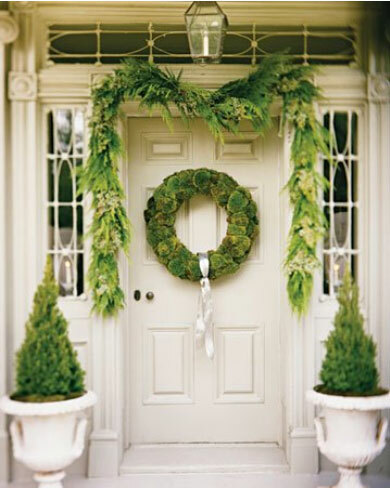 The front door is a great place to start, since this will be the beginning of your holiday wonderland of a home. Be creative in how you decorate your door, though, and avoid something overdone, boring, or just not fun. Instead, try some of these ideas and you may be surprised at how much fun you can have with your door. Be as creative as you would like and do your best to think outside of the box. You never know what you may come up with.